Authors: MATSUI, E., SALATI, E.; BRINKMANN, W. L. F.; FRIEDMAN. I. 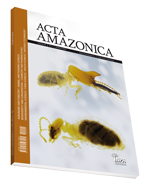 Authors: CORRÊA, R. G. C.; SILVA, M. L. da; MAIA, J. G. S.; GOTTLIEB, O. R.; MOURÃO, J. C.; MARX, M. C.; MORAES, A. A. de; KOKETSU, M.; MOURA, L. L.; MAGALHÃES, M. T.
Authors: CASTRILLÓN, A. L.; CARVALHO, R. F. de; BORBOREMA, C. A.; PECHER, S. A.